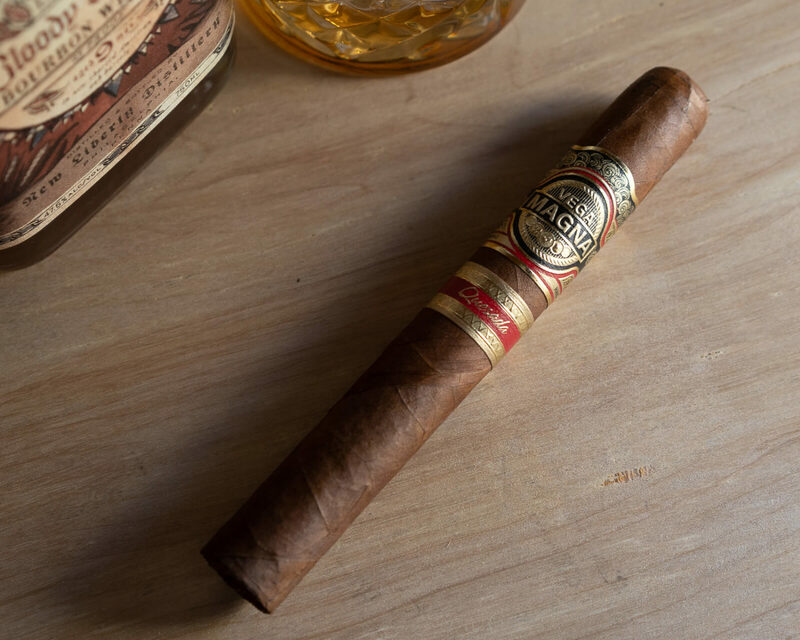 The Casa Magna Colorado was one of the first cigars to ever “wow” me (and interestingly one of the first I ever reviewed). So it goes almost without saying that this is a cigar I was extremely excited to smoke. The Vega Magna features gorgeous branding and has a worthy look following up on the legendary Casa Magna line. 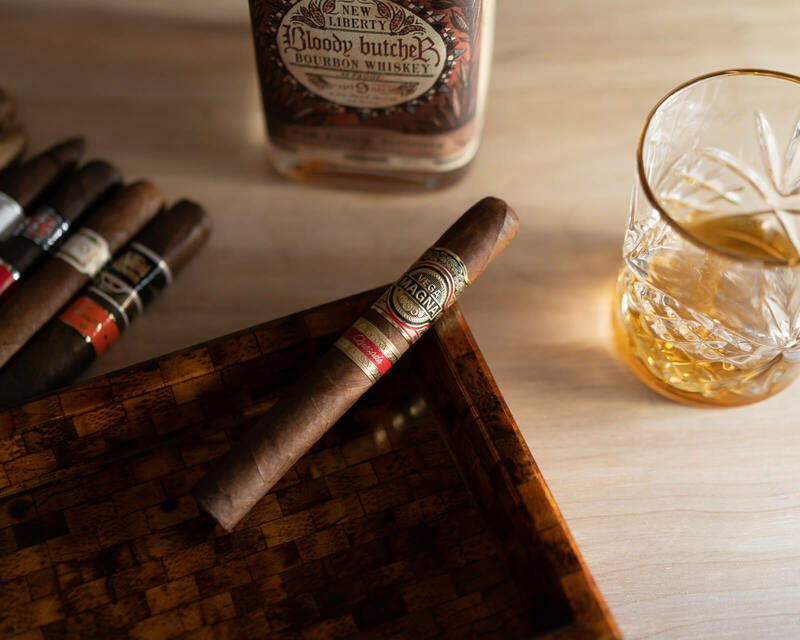 The cigar is packed tightly, with very little give when squeezed and no soft spots. The outer sun grown wrapper is a rich brown with slight reddish hues and has an amazingly textured, leathery feel. A whiff off of the foot reveals savory woodiness, spices, cured meat, and slightly sweet tobacco. The cold draw on the other hand is heavy on grilling spices and wood. It’s the kind of pre-light experience that gets me excited to light up. The Vega Magna opens with plumes of soft, toasty, mild to medium smoke. The flavors are delicious and very complex, hitting sweet, salty, savory and bitter all at once (this is a great foundation for a complex smoking experience). Specifically, there’s that salty minerality that I associate strongly with Quesada, alongside a milky chocolate and slightly bitter leather. 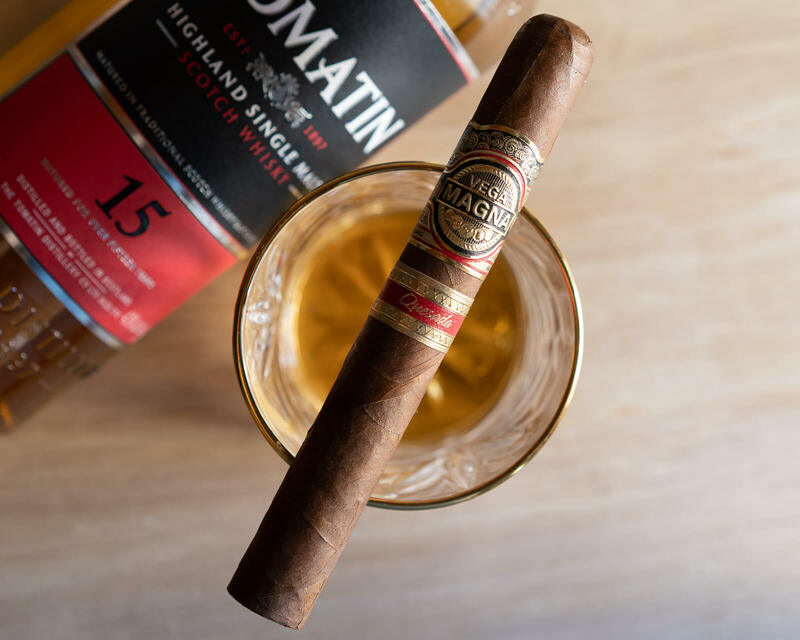 The texture of the smoke reminds me a lot of what I encounter with the Davidoff Millennium Blend: very smooth but with an almost musky, dusty old attic character. Smoke production is excellent, as is the draw. By an inch in, the salt and leather has subsided, giving center stage to milk chocolate, savory spices, and dry sliced apricot. On the retrohale is dry wood, toasted bread, and black pepper. My only complaint is that the burn has begun to falter, requiring a minor touch up. As the ember burns into the second third, the balance of flavor shifts again, favoring toasted cedar, tangy fruit, and a spice that lingers on the tip of the tongue. Body and strength have both inched slowly into medium territory. The burn now is perfectly straight and smoke production is voluminous. A bit past halfway, the chocolate note, still evident in the palate, moves into the retrohale, complementing notes of wood and mushroom. The final third of the Quesada Vega Magna is characterized at first by increased strength and body (just above medium). Flavors are mostly balanced between savory spice, wood, mushroom, and light milk chocolate, and I’m beginning to really feel the nicotine. There’s some more trouble with the burn near the end, but a few purges corrects that quickly, allowing a nice conclusion to the smoke. The Quesadas have knocked it out of the park with Vega Magna. Minor construction issues aside, it’s the kind of cigar that packs in so much flavor, complexity, and harmony that I’m almost tricked into believing in eating a second dinner. I honestly question whether I’d want to smoke this cigar in a social setting because the development of flavors requires so much attention. It’s the kind of cigar you just get lost in. Absolutely worth the higher price point. A joy to smoke. Your clearly a wordsmith and extremely clever in your description of flavors, aromas and residuals. Kudos. BTW nice tip of the hat to your humble Portland roots. Will we see a forthcoming review or comment on Broken Top Bourbon Whiskey? I poke a little bit of fun at the label but the product itself is quite good.